Despite being off the air for two years now, Gilmore Girls still has a strong following, with reruns airing on ABC Family, and plenty of discussion in the blogosphere. This highly successful show must have started off on the right foot, right? The pilot is thin on actual plot. It’s the kind of pilot that focuses on setting up a world in which a show will take place. I’d say the writers’ intention here was simply to train the audience in how to listen to these characters speak. The rapid fire dialogue filled with nonstop, sometimes obscure, pop culture references, is what makes someone either love or hate this show. When Rory, the cute, 16-year-old protagonist meets a guy, Dean (Jared Padalecki, now on Supernatural), she interrupts her own incessant babbling to say, “I never talk this much.” Already, only a few minutes into this pilot, we know that can’t possibly be true. The opening scene in which Rory (Alexis Bledel) and her also cute mother, Lorelei (Lauren Graham) sit at the diner discussing a scattershot array of topics heavily weighted toward lip gloss, leaves me feeling a little empty. They come off as vapid girly-girls. Soon enough, though, we find out that Rory reads a lot of classic literature—a character trait that seems forced at this stage. The diner is run by a less-than-friendly guy in a ball cap named Luke who, it is hinted, has the hots for Lorelei. 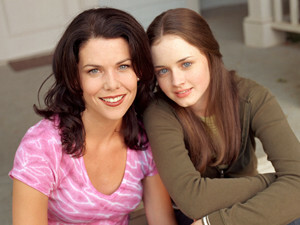 Lorelei is immediately portrayed as the “best friend” type of mom, acting as a pal to her daughter and letting her indulge a caffeine addiction. We see her limits, though, when she runs a flirtatious adult male away from Rory. So, we are introduced to the quaint New England town of Star’s Hollow, Connecticut, which looks like the next studio lot tour could wander through the background at any moment. There’s the diner—we know it’s important since the episode both begins and ends there—and there’s a very busy inn, where Lorelei works, and naturally, a public school. We find out quickly that everybody knows everybody. Having a new kid in school, in this case Dean, is always a handy device for introducing characters and locations. The most interesting character is Rory’s Korean best friend, Lane, whose parents are already planning her betrothal to a fiscally promising young man, and who changes clothes on her way to school so her mother doesn’t see her in a Woodstock T-shirt. Her ultra-conservative mother and Lorelei’s friend Sookie are both funny characters, but fall into the common pilot trap of making everyone a stereotype. The same is true of Lorelei’s parents, rich socialites who live half an hour away, and who have been largely estranged from their offspring. Snarkiness appears to be matrilineal. It is all Lorelei can do to swallow her pride and ask them for the money to send Rory to a private school. I have to wonder, why private school? Star’s Hollow doesn’t exactly seem like the kind of place where metal detectors or drug dogs are de riguer in the high school, and Lorelei is portrayed as a strong, down-to-earth type for whom public school should be good enough. If growing up Gilmore didn’t lead to the life she wanted for herself, why does she want it for her daughter? But, we have to accept the lure of private school to care whether Lorelei can come to an agreement with her parents, and whether Rory can tear herself from her new crush. And, I know teenage girls are fickle—I was one—but she’s really so in love with a guy she talked to for 20 minutes that she is ready to change her whole life’s plan and jeopardize her best pals relationship with her mother? The whole thing ends with a sickeningly cute exchange. Luke: You do not want to grow up to be like your mom. Based on this pilot, I hate this show. I watched the last couple of seasons, and found it pretty entertaining. The more mature version of Rory was interesting, her success in college enviable. The teenybopper version, however, and her teenybopper-past-her-expiration-date mom were just annoying. Sorry, fans, I know you are plentiful, but this pilot promises just another teen drama about nothing. This entry was posted in 2000s, Comedies, Dramas and tagged alexis bledel, gilmore, jared padalecki, lauren graham, lorelei, rory, stars hollow by meekthegeek. Bookmark the permalink.